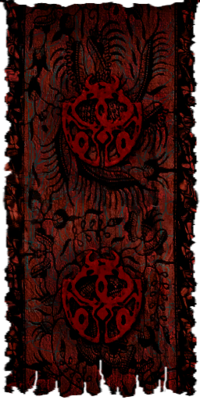 House Dagoth or simply the Sixth House is the defunct sixth Great House of the Chimer led by Voryn Dagoth, later known as Dagoth Ur. All records of the house's existence were destroyed following the Battle of Red Mountain and its members were either killed or absorbed into the remaining houses. Unbeknownst to all, Lord Dagoth had survived and spent centuries slowly building his strength and influence from within Red Mountain. This culminated with Dagoth's attempt to re-create the Dwemer god-construct Numidium in order to overthrow the Tribunal and conquer Morrowind. In 3E 427 Dagoth Ur was slain and his plans halted with the destruction of the Heart of Lorkhan by the Nerevarine. The first mentions of House Dagoth are recorded in connection to the War of the First Council between the Chimer and the Dwemer. Imperial sources claim that House Dagoth stood with the Dwemer (and identifies both as Chimer clans). However, others with more direct knowledge of the actual events, such as the Ashlander tradition and that of the Tribunal Temple depicts the war as first being prosecuted against the Dwemer by an alliance of all the Great Houses, including Dagoth. 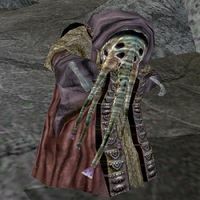 By this account, Voryn Dagoth had discovered that the Dwemer, whose king Dumac had been a close friend and ally of the Chimer Hortator Indoril Nerevar, were secretly using the Heart of Lorkhan to build a mechanical god, which was an affront to the Chimer faith. After counseling with Azura, who confirmed Dagoth's story, Neverar came before Dumac to force the issue. Dumac, however had no knowledge of this project undertaken by Kagrenac and his tonal architects, and responded with hostility to Nerevar's accusations which resulted in war. The specifics of what happened after the climactic Battle of Red Mountain are lost to history. By the Ashlander account, Voryn Dagoth wished for the destruction of Kagrenac's Tools, while Nerevar sought counsel with his advisers -- Almalexia, Sotha Sil, and Vivec. The three coveted the power of the Heart and so conspired to obtain the tools by any means, even going so far as to murder Nerevar because he would not go along with their plan. When the three came to Lord Dagoth without Nerevar he refused to hand over the tools, citing his oath to Nerevar to guard them, but was defeated and driven underneath Red Mountain, beneath even the Heart Chamber, and the Tribunal took the tools. The version of the story told by Vivec privately to his priests is somewhat different. Nerevar returned to the mountain with his advisers after deciding that Kagrenac's Tools could be used for good, but Dagoth had already experimented with them and the Heart. He fought against the Tribunal, believing only he could be trusted with the tools. Though this version does not mention how Nerevar died, it is somewhat supported by Dagoth Ur himself who, in a message to the Nerevarine states that it was Nerevar himself who "struck me down." Since Dagoth Ur had disappeared, and the rest of his house had been soundly crushed in battle, Great House Dagoth sank into obscurity until the late Second Era. Efforts to resurrect the House were made around 2E 583, but were seemingly unsuccessful. In the year 2E 882, at the close of the Second Era, Dagoth Ur and his remaining subjects became active again within Red Mountain. Having somehow been kept alive by the power of the Heart, he had spent centuries dreaming and planning. When he arose, he took possession of the Heart Chamber and with unknown rituals, bound himself to the Heart, becoming a heartwight. He also made his nobles into the first of the Ash Vampires, powerful beings who were also bound to the Heart, though not as strongly, who would serve as generals in his coming conquest. In his long sleep, he had adopted the goals of Kagrenac and set about finishing the Dwemer's ill-fated project, hoping to create a new god called Akulakhan for whom his House would serve as the priesthood. In the long term, House Dagoth and its new, immortal masters would conquer all of Tamriel and worship of Akulakhan would become its sole religion. The first blow was struck that same year when the Almsivi came to Red Mountain for the annual ritual to tap the Heart and renew their powers. Dagoth Ur and his minions ambushed them and drove them from the Heart Chamber. 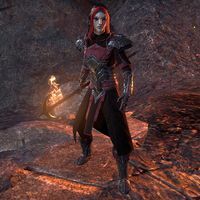 This would prove to be a pivotal event in the history of Morrowind, as the forces of the Temple would never again control the region around Red Mountain, nor would the Tribunal ever regain their full powers. With the initiative in his hands, Dagoth Ur set about expanding the number and influence of his House. To this end, he spread The Blight, terrible ash storms spawned at the center of Red Mountain that carried with them the dreaded Corprus disease which twisted its victims into monsters. Called the "Divine Disease" by the some of the Temple faithful, Corprus is in fact the effect of Dagoth Ur's power on mortal flesh. Those deemed unworthy to the cause it turns into mindless husks, but those with potential to serve it made into Ash Creatures, beings whose bodies and minds are progressively warped by the alien designs of Dagoth Ur. These creatures would go on to promote the interests of the House throughout Vvardenfel, notably by influencing the dreams of some susceptible Dunmer. These "Sleepers" would go into a trance-like state and act as conduits for the thoughts and message of Dagoth Ur, and even act as assassins. The Sixth House demonstrated a tremendous amount of foresight, and constantly looked towards its long-term goals. While House Dagoth was ideologically expansionist, it was also very slow and methodical in its movements. In more than 400 years of conflict with the Tribunal, House Dagoth hardly expanded from Red Mountain—only to some ancient Dunmer strongholds and smuggler's caves. This was largely due to Dagoth Ur's apprehension of the Empire. He knew that a premature conflict would result in the inevitable defeat of his House, and so shunned open conflict, at least until Akulakhan could be completed. For the following four hundred years (roughly the first four hundred years of the Third Era), Almsivi sent raiding parties in an attempt to capture the Heart Chamber, but they were always unsuccessful. Blight storms become progressively stronger and affect more and more of Vvardenfell, posing a dire threat to its people. In an attempt to contain the Blight, the Almsivi constructed the Great Ghostfence. Maintaining it required a significant amount of power which was increasingly in short supply, as the Tribunal had not had access to the Heart for centuries. Rather than breach the Ghostfence directly, House Dagoth made use of smuggler bases and ships along the Bitter Coast to spread its influence among the populace. With these, they exported idols called Ash Statues, which agents of the House sold and spread around populated areas. These statues seemingly contained some modicum of Dagoth Ur's power, and would corrupt those who were exposed to them consistently. In 3E 400, Dagoth Uthol took control of the old Dunmer fortress of Kogoruhn and created an underground tunnel leading under the Ghostfence, into Red Mountain, creating an additional avenue for forces and supplies to pass into Vvardenfell. Several years later in 3E 417, disaster struck the Tribunal when the artifacts Sunder and Keening were lost in an ill-fated expedition to Red Mountain by Almalexia and Sotha Sil. Only the intervention of Vivec saved his two companions, but the tools were lost. Dagoth Odros and Vemyn would hold Sunder and Keening in their respective Dwemer fortresses in the Ashlands for safekeeping. After this defeat, the Tribunal retired to their capitals and there were no more serious offensives against Dagoth's holdings until the coming of the Nerevarine. Dagoth Ur, though he now held Sunder and Keening, lacked Wraithguard to bind them all together. The best he could have done would be to study Sunder and Keening's enchantments and attempt to duplicate them himself. In 3E 426-7, there was a sudden spike in Sixth House cult activity, including the assassinations of several high-profile Imperial sympathizers as well as foreign Imperial citizens living in Vvardenfell. This may have been intended as a challenge to the authority of the Tribunal, or an attempt to further sour relations between the Dunmer and their Imperial suzerain. It's not known whether this had any bearing on Uriel Septim VII's decision to send the would-be Nerevarine to Vvardenfell that same year. Due to the purge of records associated with House Dagoth, very little is known about its culture and character. One of the few extant documents describes them as "subtle" and having a penchant for diplomacy and subterfuge. This may go some way to explain Dagoth Ur's willingness to take up the failed project of his race's ancient enemy, as well as his seemingly conciliatory attitude towards the Nerevarine. The risen House Dagoth displays a pronounced affinity for sound and music, though it's difficult to know if this was part of its makeup before its fall. Nearly every shrine encountered in Vvardenfell features a set of large bells or chimes, which seemingly play an important role in its rituals. Some of the more advanced forms of Ash Creature have long, perforated, trunk-like snouts which may be used as musical instruments. [UOL 1] The fictional epic Poison Song depicts the house having a strong connection to music to the point that its descendants can somehow "hear" its songs still, though it's unclear what basis, if any, this has in reality. This page was last modified on 14 November 2018, at 16:27.